Stopping today at Xerox and Kodak Drupa is like riding a tour bus. Drupa is like riding a tour bus. You get to see a whole lot of things from a distance and relatively few things up close. A whole lot of stuff just flies by the windows and you have no hope of seeing it all. And no one can see it all. There are about 1900 vendors showing their wares here at drupa. that if you spent a mere 15 minutes in each stand it would take 475 hours out of your life. The problem is, over its entire run, drupa is only open for 136 hours. So you have to jump off the bus when you see something interesting and take a longer look --and get back on the bus to get to the next attraction. Since even the carefully chosen stops this bus have to be so brief, you can only get a glimpse of what's happening at each place we stop. So I'll give you a few quick takes on some interesting stuff from some key players. And I'll hit some of them a couple of times, just to keep up with the bus. Xerox had the usual number of big engines in their stand and we'll get to those on this stop, but one of the more interesting things at the stop in Hall 8B was the new 700 model Digital Color Press. 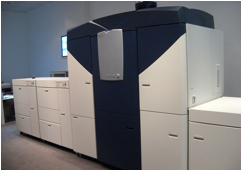 This is a console style 70-ppm device that uses low-melt EA toner and delivers a matte finish to images, rather than the glossy image that has often been common on Xerox devices. EA (Emulsion Aggregation) is Xerox's chemically grown toner which requires less energy to manufacture and print. It has been available in other devices for some time, but this is the first implementation of it in a low-melt formulation. The images I saw were excellent for this type of device and certainly sellable in most any print shop. The new box features 2400 x 2400 registration and has front to back registration of +/- 1.0 mm. The machine will have a choice of Creo, EFI and Xerox RIPs and a number of finishing options. It is available now in Europe, Russia, the Middel East and India; the U.S and Latin America come on line in August and September. Getting off the bus at the Xerox stand puts one in what seems to be iGen City, with the eight-foot-tall devices towering over the milling throngs. 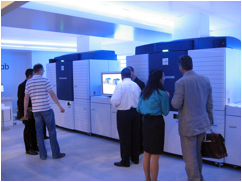 The current iGen3 has received some upgrades in print quality thanks to more automation in calibration and measurement of images being printed, but the bigger attractions were in an alcove and behind some closed doors. The first stop on the tour was the dual engine ColorConcept 220, a melding of two iGen3 presses to create a 220-ppm full color perfecting press. The first engine prints the front and the second the back, just as is done with the company's Nuvera 288 which joins at the hip a pair of Nuvera 144s. This machine is being shown at drupa as a concept, but word has it we may see it sometime in 2009. Xerox is measuring reaction to it and Xerox President Ursula Burns said at an analyst dinner that people seeing the twin tower machine were responding positively. A dual engine color device poses challenges far more complex than mere paper flow. 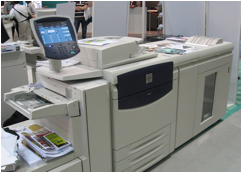 Most critical, colors must match on both sides of a document throughout a print run (and on repeats of the same job) or the device is a non-starter. The ConceptColor 220 is using multiple inline densitometers to help keep color under control, and the feedback loop that continually monitors and adjusts color is very complex. Keeping color under control is not insurmountable, but as the system is still in development we'll have to wait and see. If this one flies, sources tell me, expect take off to occur sometime in 2009. Next door, in a room all its own but available for the curious to see is the iGen4. This has somewhat different skins than the present machine and has a lot more going on underneath, with multiple new software and hardware elements that raise the bar significantly on image quality. I'll be following up with more details on that later. I got a look at some of the sample prints -- side-by-side with offset versions-- and was pleasantly surprised to find the digital ones every bit as good. When you see samples like this you know they have been picked to show off some features, even as they hide flaws, but these were in a different league than I'd seen from other iGen prints. Except for a very few minor details, these looked a lot like offset and more importantly felt like offset to my fingertips. This is just my first impression, and I want to see a whole lot more samples, but this device should be more than up to the task of printing apps like photo books and marketing materials where quality is critical. On the other hand, I was disappointed to learn that the new machine doesn't come with an uptick in speed. With HP-Indigo 7000 and the Kodak NexPress 3600 both now trumping the iGen on speed, the time has come to turn up the wick and give this machine the speed to go with its image quality. There's more at Xerox, and this bus will make another stop. Likewise, Kodak has a lot to show, but I'll leave the print engines until next time. The NexPress has had a 5th toner station for some time and it was somewhat limited. Adding colors would pump up the color gamut as needed and the clear toner could lay down a nice matte finish, or a hard gloss when used with an offliine NexGlosser. Now there are multiple 5th station modules that provide new features such as simulating thermography, adding an assortment of textures and variable glossing options. For example, an image of a painting can be hit with a layer of special toner so it looks almost as if it was painted. Different levels of gloss can be applied to images to give the appearance of a spot varnish, and clear toner can be applied on its own to bring out images that only appear when a page is turned to certain angles. Different 5th stations are required for each effect, but it is easy to imagine a busy shop having a selection of stations --and adding value to documents with each one. Pricing varies for the stations, but the ballpark is around $70,000 and any smart printer should be able to see an ROI in just few months from a shrewdly selected set of 5th stations for their NexPress. This was absolutely one of the coolest things I've seen here at drupa and it will make money for printers looking to keep their competitive edge sharp. I'll be coming back to Kodak again, but I have to get back on the bus and go to Xeikon and see what they are doing with labels. And that's the next stop.